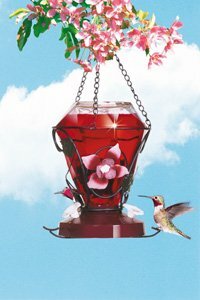 Blossom Edition Hummingbird Feeder.Feeder is crafted from decorative wire. Beautiful 24 ounce capacity glass bottle. Hummingbird enticing metal flowers accent this attractive feeder. Each blossom edition feeder has 3 honeysuckle feeding stations.